In late summer when annuals and perennials begin showing signs of fatigue, look to the chrysanthemum to add beauty to your autumn gardens and flower beds. Commonly known as mums, chrysanthemums are hardy and colorful. They come in an assortment of colors and annual or perennial varieties that look great planted or potted. When planted in late summer, mums can often endure the first frost of autumn. When in bloom, they may last up to several weeks. When considering mums as perennials, it’s best to plant in the spring in order to allow them plenty of time to establish roots throughout the summer and fall. The perennial mum will need to be cared for like any perennial. 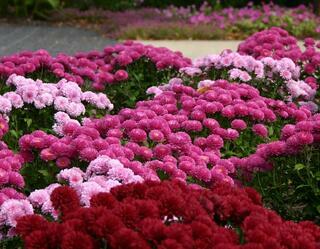 For the best fall blooms, fertilize, mulch and pinch mums during the spring and summer. For a relatively inexpensive option that provides the same beautiful fall color, choose annual mums. As autumn rolls around, start thinking about spring bulb options for your landscapes. After the snow melts and life begins to reemerge, you'll be glad you planted bulbs in the fall. Spring bulbs will add radiance to any garden or walkway and come in a wide variety of options. Popular spring bulbs include tulips, hyacinths, daffodils and lilies—all of which can be interspersed with perennials, leaving your beds, entrances and walkways vibrant throughout the spring and summer. Because every season has a limited window of opportunity when it comes to planting to get the most vibrant seasonal color, we encourage you to discuss these solutions for colorful landscapes with your account manager. We promise you will love them. Add beauty and dimension to your landscapes using fall mums and spring bulbs. Not only will you be adding beauty in what many consider “off-seasons,” but you’ll be investing in flowering plants that will surely make your property stand out.